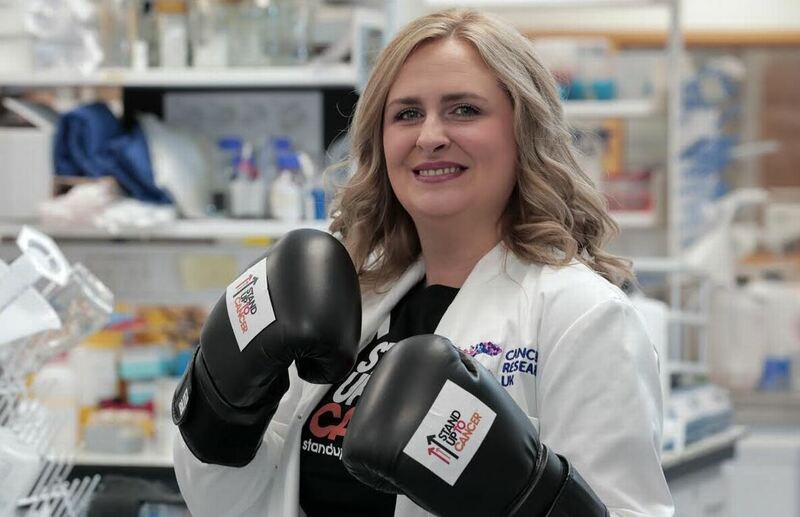 Dr Emma Kerr, CRUK Career Development Fellow and Principal Investigator in the Centre for Cancer Research and Cell Biology (CCRCB) at Queen’s, is calling on Northern Ireland to ‘Stand Up To Cancer’ to help save lives. The Senior Research Fellow in the School of Medicine, Dentistry and Biomedical Sciences at Queen’s has recently been awarded £1.8m to help beat the disease by Cancer Research UK (CRUK). Dr Kerr was encouraging men and women here to strike a blow against cancer by raising money for vital research, culminating in a major live TV event on Channel 4 on Friday 26 October. Stand Up To Cancer, which has raised over £38m since its UK launch in 2012, called on the nation to ‘tune in, join the fight and raise cash’ to help speed up life-saving research, with an evening of ‘celebrity challenges, exclusive programming and super-smart science’ hosted by Alan Carr, Maya Jama and Adam Hills. Dr Kerr’s work in CCRCB is seeking to find new ways to tackle bowel cancer, by studying how the disease hijacks normal processes the body’s cells use to make energy and grow. These changes can help bowel cancers resist chemotherapy, making treatment less effective. Originally from Derry/Londonderry, Dr Kerr told Derry Now: “The majority of bowel cancer patients will at some stage receive chemotherapy but unfortunately some will develop drug resistance and their tumour will stop responding to treatment. The two times Queen’s graduate (BSc Biomedical Science 2008, PhD Oncology and Cancer Biology 2011), studied under Professors Patrick Johnston and Dan Longley, two of the world’s leading bowel cancer scientists. Her research then took her to the University of Cambridge for six years to study lung cancer. She returned to Northern Ireland in June this year, after being awarded £1.8 million by Cancer Research UK to start her own research group at the Centre for Cancer Research and Cell Biology at Queen’s. Dr Kerr added: “Research is cancer’s number one enemy. Stand Up To Cancer helps fund clinical trials and research projects which pack a punch in the fight against the disease. “This research is crucial, but also very expensive. That’s why I’m calling on Northern Ireland’s fundraisers to get fighting fit and help doctors and scientists speed through breakthroughs for the benefit of cancer patients across the country. Dr Victoria Steven, Cancer Research UK spokesperson for Northern Ireland, said: “It’s time to make a stand and get payback on cancer for all the people whose lives have been cut short by this devastating disease. To find out about supporting medical research at Queen’s visit the Development and Alumni Relations Office website or contact Teresa Sloan, Head of Health Fundraising, telephone +44 (0)28 9097 5394. Any medical queries arising as a result of this news story should be discussed with your GP/consultant and not DARO staff. General enquiries about this news story to Gerry Power, Communications Officer, Development and Alumni Relations Office, Queen’s University Belfast, tel: +44 (0)28 9097 5321. This story is extracted from an article which first appeared in Derry Now and Belfast Live; photo credit Belfast Live.